VA Health Care's Chronic Ailments: Long Waits And Red Tape : Shots - Health News Problems at the VA are not new; the system has struggled for years to deliver health care in a timely manner. Most of those enduring long waits are older vets from Vietnam, Korea and World War II. 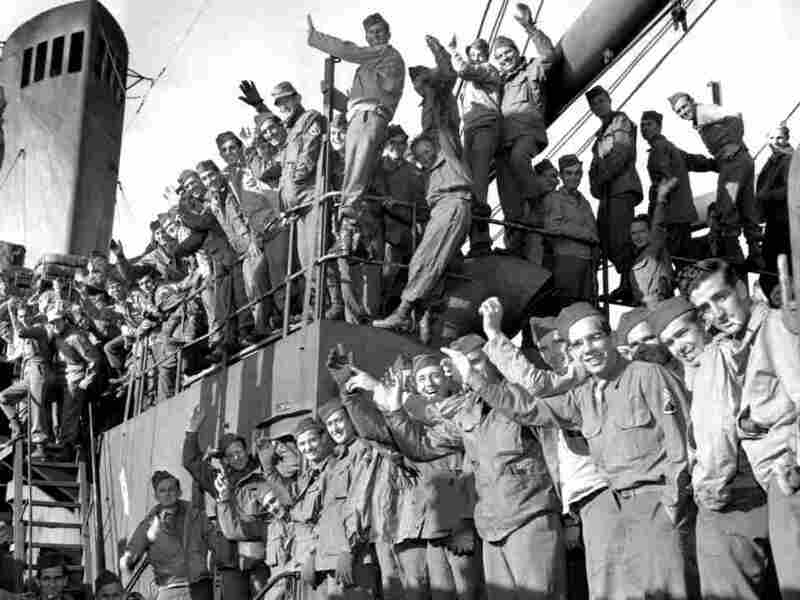 Soldiers returning from the Pacific wave from the deck of the USS General Mitchell on Dec. 11, 1945. Much of the health care demand in the VA system is from veterans of earlier wars. But still, it's not the young vets who are filling up the VA waitlists — that would be the more than 10 million vets of Vietnam, Korea and even World War II, who are older and need more care. And they're more likely to be the ones waiting. Despite the ugly headlines, veterans rate their care and benefits very highly. The major hurdle for the VA is access to care. The issue of wait times has plagued the Veterans Health Administration (VHA) for years. The department's own inspector general has issued 18 reports on the subject since 2005, all warning that veterans were waiting too long for medical appointments. It may just be simple math: The department says that in the past year, primary care visits rose 50 percent while the number of primary care doctors went up just 9 present. The recent scandal is less about the wait times and more about covering them up. The inspector general also has repeatedly warned of serious flaws in the VA's internal reporting on whether a patient was seen within the target time of 14 days. VA had claimed to be seeing 90 percent of patients within 14 days; the inspector general estimated the real number at only 41 percent. Many clinics continued to "game the system," finding ways to report they had met their performance goals. This allowed executives to collect bonuses, including those at the now infamous Phoenix VA hospital. In April, a whistleblower who formerly worked at the Phoenix VA health system told CNN that executives there kept a separate list of how long patients actually waited (months) but only entered appointments into the VA's electronic database once the wait time would be 14 days or less. The whistleblower, Dr. Sam Foote, claimed as many as 40 patients died while on that list. But there is still no evidence that any of these patients died because of the wait; some of them were terminally ill.
As other whistleblowers came forward around the country, the problem of wait times and unofficial lists turned out to be systemic. The VA's inspector general is now investigating scores of VA sites. An audit ordered by then-VA Secretary Eric Shinseki has estimated that 60 percent of VA facilities were gaming the system. The day he resigned, Shinseki admitted he hadn't been aware of how bad the situation was. The disability claims backlog is a separate issue from wait times. The Veterans Benefits Administration (VBA) processes claims of service-related injury for vets, giving them a disability rating that determines how much they may get in a monthly stipend. In spring of 2013, the number of claimants who had been waiting more than 120 days hit a peak over 600,000. Part of the problem was new, post-9/11 vets coming back from war and filing claims in high numbers. But a large part of the backlog was anticipated. In 2010, the VA decided to stop disputing many conditions linked to exposure to Agent Orange. The VA also stopped contesting claims from unexplained Gulf War illness and combat-related PTSD, adding hundreds of thousands of new cases to the backlog. Through a combination of mandatory overtime and use of a new electronic system (as opposed to the VA's previous decades of processing claims on paper), the backlog has been dropping steadily; it's now below half the peak in March 2013. But some veterans groups point out that the backlog of appealed decisions remains high — and they raise questions about whether speed has compromised accuracy. All the major veterans service organizations say they like the care at the VA, and they think nothing is better for veterans dealing with PTSD, traumatic brain injury, spinal injury and care of amputees. Studies have shown that veterans who are getting VHA care are less likely to be among the estimated 22 veterans per day who commit suicide. The VBA can offer home loans and the post-9/11 GI bill for school, as well as emergency aid to veterans who find themselves homeless. But that's only available to vets who make it through the gantlet of red tape to get an appointment, get a disability rating, and maybe file a few appeals of decisions along the way. The term "red tape" possibly originated from the tape used to bind Civil War veterans' records. Many veterans' advocates say they fear that the latest scandals will scare vets away from all the help the VA can lend. A poll in USA Today said public confidence in VA care has dropped to a new low: Just 1 in 5 had a favorable view of the job government is doing taking care of veterans.